Bible teacher and popular speaker Amanda Anderson shows women how to form the safe, sane friendships that enable them to become the person God intends them to be. Amanda Anderson spent many exhausting years trying to find and become the perfect friend until she a made an illuminating discovery: all of her friends had "issues," including herself. But she found that her closest friends admitted and talked about them--and loved each other in spite of them. Conversational and funny, All My Friends Have Issues shares practical relationship advice, biblical insights, and psychological truths that help women form the kinds of friendships they long for. The key, Anderson says, is to build those relationships on the three pillars of healthy Christian friendship: authenticity, encouragement, and accountability. By cultivating those characteristics in friendship, women will discover the safe, satisfying relationships that lead to personal flourishing, deep well-being, and spiritual growth. 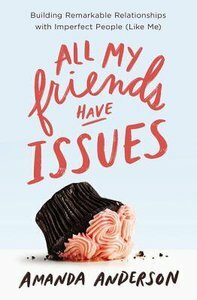 Blending Scriptural teaching with the best of evidence-based therapeutic models and personal stories, All My Friends Have Issues is a liberating guide to finding and becoming the best kind of friend. About "All My Friends Have Issues: Building Remarkable Relationships With Imperfect People (Like Me)"
Anderson is Professor of English at The Johns Hopkins University. Expected to ship September 2019.